This 1970s Style design was inspired by the colours and patterns featured on fabrics, wallpapers and homewares of the decade. The motifs running down the corners of the design were inspired by the beaded 'curtains' that were popular in homes during the Seventies. 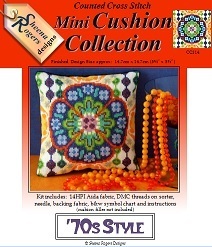 This mini cushion cross stitch kit includes: 14HPI white aida, ready-sorted DMC threads on sorter, needle, backing fabric, b&w symbol chart and instructions (cushion filler not included). The design size is 5¾" (14.7cm) square and only whole cross stitch is required throughout the design.